Robe was a proud sponsor of the 2016 Signal Festival of Light, staged over four days in and around the beautiful and magical city of Prague in the Czech Republic. Twenty-three original and innovative pieces of light art drew estimated crowds of up to 400,000 into the city to enjoy the event which started in 2013, and is now recognised as one of the biggest as well as one of Europe’s foremost festivals of light. Robe provided 80 of their Pointe multi-functional moving lights and 40 ColorStrobes for an installation by Russian based collective TUNDRA. “Epicenter v2” was staged at the Palac Narodni, a retail and residential development which is currently still under construction and features with a large cylindrical two storey void right in the centre. 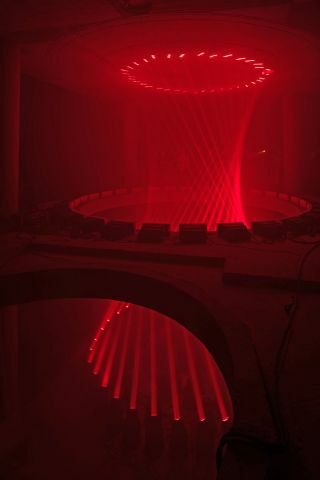 The work was designed especially to fit this space and create an extreme psychological experience with pulsating, flashing and exploding hotspots of light accompanied by disorientating and unnerving sounds, drawing viewers into an entirely unknown and mysterious environment. In this surreal installation, light plays the main role, revealing all that it hides within. From a swirl of fireflies to a futuristic landscape formed from a tight cone of light or a flickering flame blossoming forth … all reaching a crescendo in a thunderous dance of lightning. The idea was that participants gain access “like uninvited witnesses” to the epicentre of a rare natural or even supernatural ritual … being performed with light. This interventionist concept was to challenge and surprise those who might be expecting a more standard ’light show’. The Pointes were positioned on the ground floor and shot multiple beams and effects up and on to the 7 metre high ceiling of the space which was two floors above. They were selected as a good fixture to give a wide range of turbulent effects and arbitrary patterns. The white Robe Strobes, covered with a special diffuser, were positioned around the inside of the first floor balcony – and the audience – limited to 200 per show - also stood at this level a few metres back. TUNDRA has worked with Robe products for some time. “The technical specifications of the Pointe gave us the simplicity and purity we needed in the light source as well as total freedom to achieve multiple effects,” said Alexander Lezius from Tundra. Random algorithms and noises were applied to the different parameters of the Pointes to create a more organic feel to the movement, it was important that this didn’t seem robotic or predictable. The venue was the biggest challenge for the TUNDRA team comprising Klim Sukhanov, Semyon Perevoschikov and Alexander Lezius with their producer Juliette Bibasse plus the onsite support of Pavel Zmunchila who assisted with the custom diffusers. The fact that Palac Narodni is still an active construction site meant they had to adapt the initial setup, which was a productive exercise in itself as it allowed them to create a completely new iteration of Epicenter.